 If the accused cannot afford to post bail, he must invoke his Constitutional right to a speedy trial. The court is then obligated to hold hearings at the most expeditious schedule. 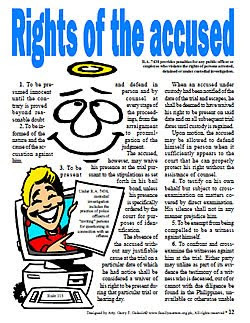 The accused can ask for the dismissal of the case on the merits if his or her right to a speedy trial is violated. An example of violation of the right to a speedy trial: the private complainant has been absent during the hearings for three or more times despite being notified. Notice of the hearings can be given in open court or by registered mail. If the calendar of cases posted outside the courtroom contains the annotation “NR” or “No ret,” this means “No return” or that the return card of the registered mail has not been received by the court staff. If any party is absent because he or she has not been notified of the hearing, then it is reset to another date. Most judges and fiscals (public prosecutors) are reluctant to grant or agree with the motion of the accused for a dismissal based on the violation of the Constitutional right to a speedy trial. They would rather prefer a provisional dismissal. For fiscals, a dismissal based on the Constitutional right to a speedy trial is a stain on the performance of their duties. Before judges grant a provisional dismissal, they instruct the defense counsel (technically called as “counsel de parte”) to explain to the accused that the case can be revived within a certain time period. If the accused has posted bail (or if no bail has been required as in cases falling under the Rules on Summary Procedure) and the private complainant has been absent for several times, the case can be dismissed on the ground of “failure to prosecute”. Under Republic Act 7438 “Rights of Person Under Custodial Investigation”, custodial investigation includes the practice of police officers of “inviting” persons for questioning in connection with an offense. It provides penalties for any public officer or employee who violates the rights of persons arrested, detained or under custodial investigation. Please read Republic Act 8493 “Speedy Trial Act of 1998”. Selected provisions are posted below. (a) To be presumed innocent until the contrary is proved beyond reasonable doubt. (b) To be informed of the nature and cause of the accusation against him. Time limit for trial - In criminal cases involving per-sons charged of a crime (except for those falling under the Rules on Summary procedure) the judge shall after consultation with the public prosecutor and counsel for the accused, set the case for continuous trial on a weekly or other short-term trial calendar at the earliest possible time so as to ensure speedy trial. In no case shall the entire trial period exceed one hundred eighty (180) days from the first day of trial, except as authorized by the Chief Justice of the Supreme Court. Time limit between filing of information and arraignment, and between arraignment and the trial - the arraignment shall be held within thirty (30) days from the filing of the information, or from the date the accused has appeared before the judge or court in which the charge is pending, whichever date last occurs. Thereafter, where a plea of not guilty is entered, the accused shall have at least fifteen (15) days to prepare for trial. Trial shall commence thirty (30) days from arraignment as fixed by the court. If the accused pleads not guilty to the crime charged, he shall state whether he inter-poses a negative or affirmative defense. A negative defense shall require the prosecution to prove the guilt of the accused beyond reasonable doubt, while an affirmative defense may modify the order of trial and require the accused to prove such defense by clear and convincing evidence. Time limit following an order for new trial - the trial shall commence within thirty days from the date the order for new trial becomes final, except that the court retrying the case may extend such period but in any case shall not exceed one hundred eighty (180) days from the date the order for new trial becomes final if unavailability of witnesses or other factors resulting from passage of time shall make trial within thirty (30) days impractical.